Sorry for the quality of images. Heavily cropped. It's always the fuzzy ones that make me think I have something different haha. Pied-billed Grebe? Common Goldeneye female? Bufflehead Female? If possible to try and ID. Thank you in advance. Wow, even tried using a magnifying glass. 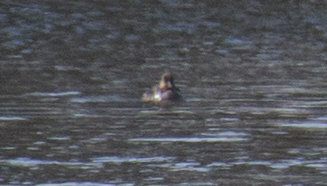 Don't think it is a Grebe, possibly a female Bufflehead. Can you provide any additional information, approximate size? This might sort the men/women from the boys/girls. Here's a photo with Hooded Mergansers near the two of them. Thank you.